Did you know we offer Occupational Health services? This includes 3 Preventative Intervention Programs (BackFit, DeskFit & Team Health), which are designed to decrease injury risk & rates amongst your workforce. We also complete Capacity Profiling, Job Capacity Assessments and Pre-Employment Functional Screening, to help improve your recruiting process and decrease the risk of potential future claims, by providing you with specific and accurate information on a worker’s capacity to complete the tasks associated with their employment. Further information on all Occupational Health services can be found below, or at www.paceoh.com.au . 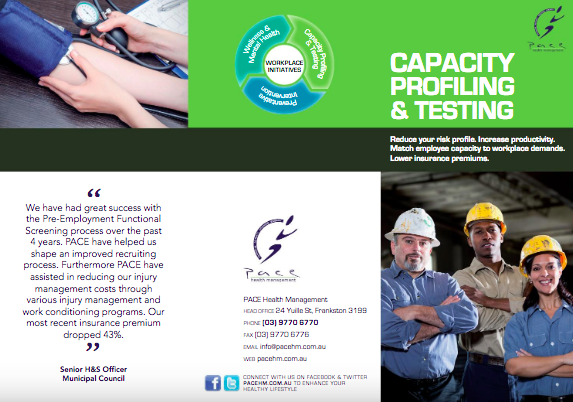 Please contact us today at info@pacehm.com.au to learn more about the benefits of implementing a Preventative Intervention Program or standardised capacity profiling & pre-employment screening.